Oculus Rift offers some pretty out of this world experiences (punching sharks andbecoming a bird immediately come to mind), but getting an up-close and personal with the sun aren't among them. Until now, of course. That, my friends, is whatSunshine Observation Deck is for. If it looks familiar, that's because it's based off of a set from the 2007 Danny Boyle flick, Sunshine -- you know, the one that heavilyinfluenced the original Dead Space and that's by far one of the best sci-fi flicks from the past ten years. 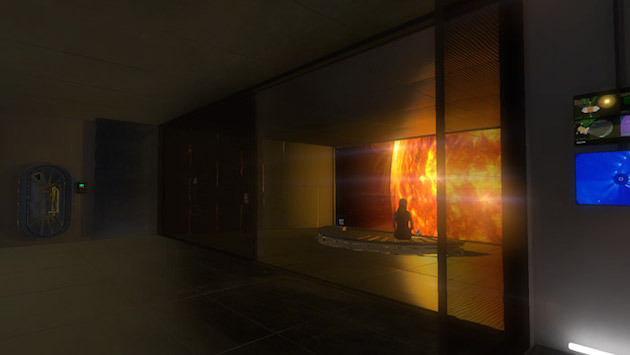 Anyhow, the walkthrough lets you explore the movie's solar observation deck and adjoining science lab, witnessing Sol in its fiery majesty. You can't adjust the intensity of the filter brightness, but given that, you don't need to worry about catching a nasty sunburn, either.